Emma Watson may only be 23, but she&apos;s an old pro at walking the red carpet. Thanks to the &apos;Harry Potter&apos; film series, which ran from 2001 to 2011, she&apos;s been in the public eye since age nine—which means those awkward teen years were all captured on camera! Okay, in Emma&apos;s case, maybe they weren&apos;t THAT awkward... but she does look quite different now. Let&apos;s take a look at her beauty evolution over the years and see what&apos;s changed. In our first photo, Emma is 11 years old—what a cute kid! We&apos;ve got the freckles; we&apos;ve got the straight, dark brows. Even her hair colour is a match to the shade she wears today. Emma was 12 here; is it wrong to have eyebrow envy? Even before I over-tweezed them in the &apos;00s, I don&apos;t think mine were ever like THIS. Notice her teeth (which she later had fixed), and her nose (which is possibly wider compared to now). Bless her heart—with the curly tendrils and flower in her hair, Emma looks like she&apos;s going to the prom instead of a big-time movie premiere. By this time, she was 14, and maybe had grown into her nose a bit. Her eyebrows have been aggressively tweezed (as was the fashion back then), what a shame! Now, it&apos;s 2005 and Emma is 15. With her subtle Ombré, she was years ahead of the trend! There&apos;s nothing award about this look—it&apos;s as fresh and pretty today as it was a decade ago. I think her nose looks the same as it was in the earlier photos, do you? The big change here is lighter hair—and eyebrows! She pulls them off, but they kind of wash her out. She was 17 here. 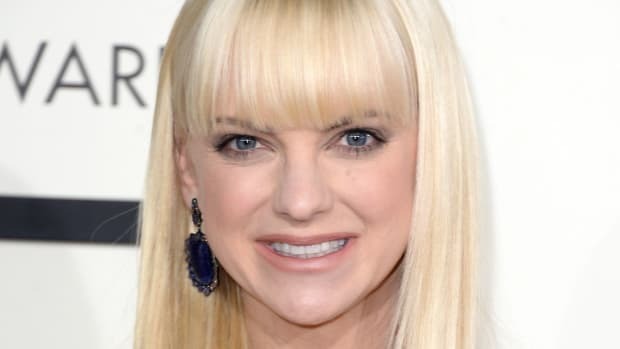 If she changed her nose by this point (it&apos;s the most common celeb surgery), the work was extremely well done. By 2009, Emma was all grown up. Darkening her colour again shows off her lovely skin, and I also love the placement of the blush. Chopping off your hair is a rite of passage for so many stars, and Emma did just that in 2010, age 20. She wears this pixie amazingly well! The makeup also got a stylish upgrade, featuring black liner and a light, matte lipstick. But the main change to notice is her smile. 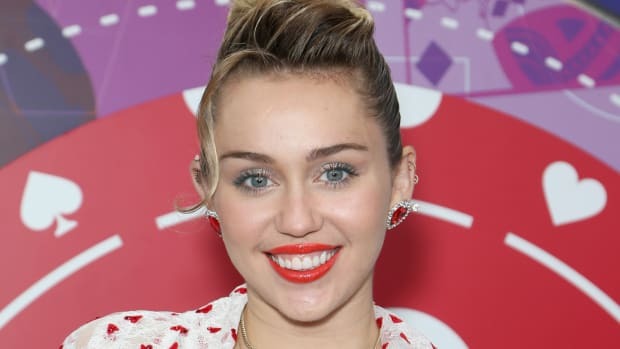 Her teeth are all straight and even now, indicating some cosmetic dental work was done, probably including veneers. The short hair stuck around through 2011, with styling that was even more daring. These smoky gold and charcoal eyes with bits of glitter are a work of art! And her skin is flawless. Her face is a makeup artist&apos;s dream! Emma really has great taste in makeup—you won&apos;t see her in false lashes or heavy contouring! This look is so beautiful and delicate, and finally her eyebrows have returned to their former glory. By 2014, Emma&apos;s hair had grown long, cut into skinny tapered ends. She rarely wears it down on the red carpet, so it&apos;s nice to see! The makeup is still very low-key, with subtle kitten liner to accentuate her eyes. Emma Watson at the 2015 Time 100 Gala. In the past few years, Emma has been wearing a lot of red lipstick, with fresh skin, chunky lashes and tawny brown shadow. It&apos;s more classic than trendy, but never looks overdone. In 2016, Emma cut her hair into this bob, and it&apos;s super-adorable in a half-up style, with volume at the front. I love the effortless vibes it brings to a red lip and the same kitten liner as in 2014. That brings us to 2017, and an Emma who looks more sophisticated than ever. The 360-degree application of brown shadow is an adventurous choice, but her freckles and airy updo keep it fresh. And there&apos;s that perfect smile again! 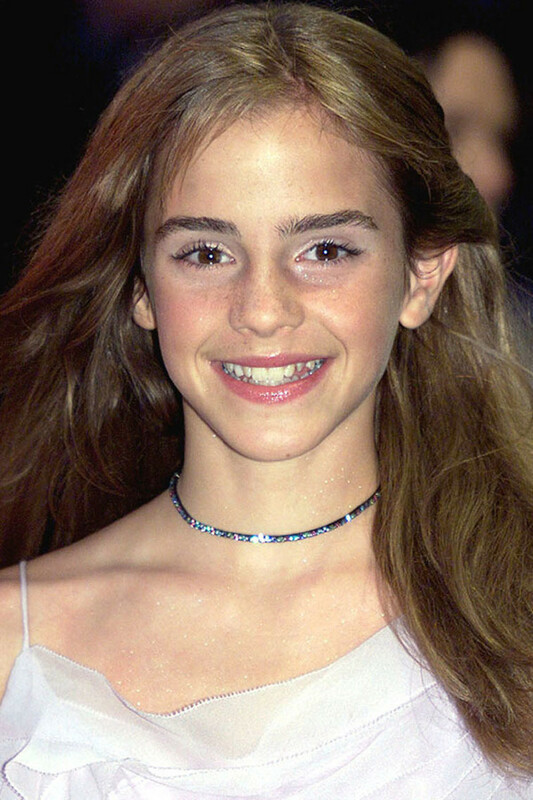 Emma Watson in 2002 (left) and in 2013 (right). 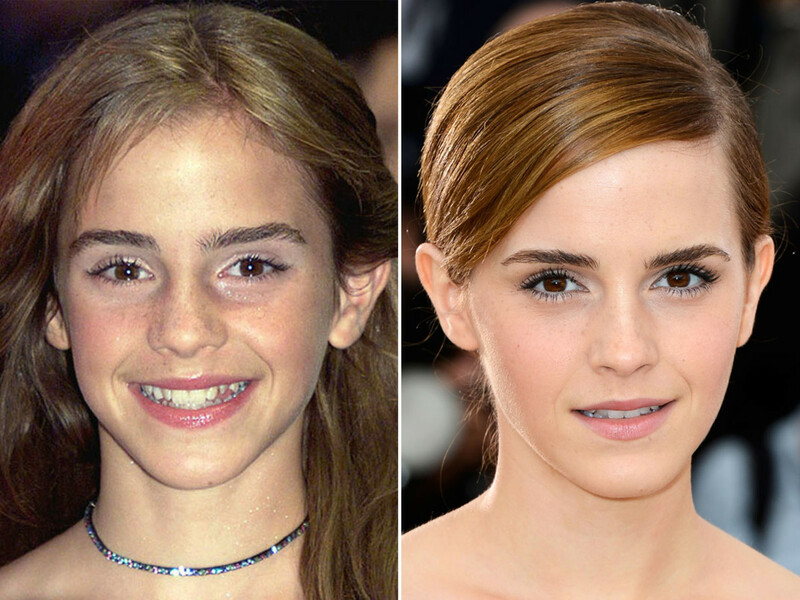 So can we attribute the changes in Emma&apos;s appearance to the normal maturation process from tween to young adult? Or did she undergo a more permanent procedure? While there have been rumours that Emma had a nose job, I&apos;m not convinced that happened, looking at these pics. If she had any reshaping done, it was very conservative, and to have happened while she was still in her teens! On the subject of plastic surgery, Emma told Elle: "I find LA quite scary because of that—all those young people having plastic surgery. But the thing is, I don&apos;t want to look like everyone else. I don&apos;t have perfect teeth, I&apos;m not stick thin. I want to be the person who feels great in her body and can say that she loves it and doesn’t want to change anything. It&apos;s ridiculous that seems such an unrealistic goal. I think the actresses who are really successful are the ones who are comfortable in their own skins and still look human."